Elsevier’s CiteScore is currently the only metric for more than 200 top-quality academic journals from numerous renowned publishers that guides them in their exceptional work. Metrics are an important tool to determine editorial choices when editing research journals and managing their role in their respective fields. Analysis by Elsevier, a global information analytics company specializing in science and health, has found 216 journals from 70 publishing houses in the top 10% of the most-cited journals in their subject category with no critical journal metric other than CiteScore. CiteScore is the only fast and readily available metric to allow these journalsto be recognized as highly-influential publications. Each of the 216 journals have been published 45 times or more in the past three years. Taylor and Francis is the publishing house with the highest number of journals in the top 10% for their subject areas that only benefit from a CiteScore, Elsevier is second (28 journals) and Springer Nature third (20 journals). 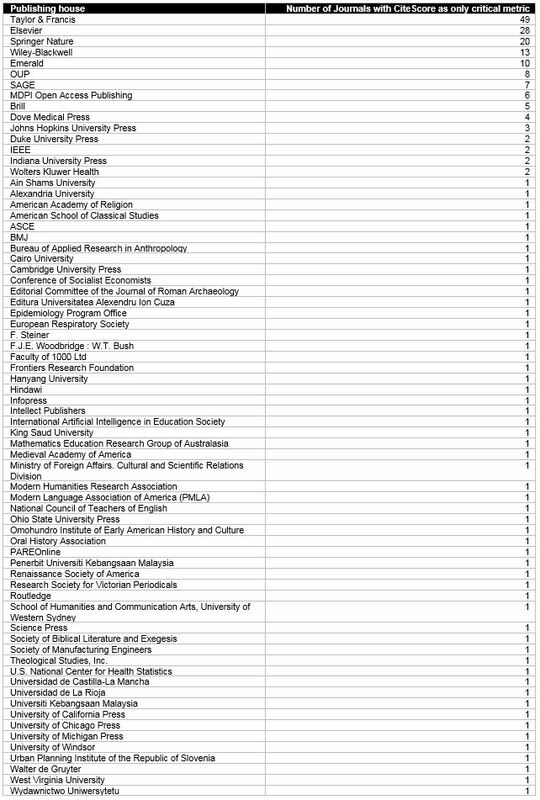 A full list of publishers and the number of journals is included below. CiteScore metrics were launched in December 2016 in response to academia’s call for metrics that provide a broader, more transparent view of an academic journal’s citation impact. CiteScore metrics are part of a basket of metrics available on Scopus (including journal, author, institutional, and article-level metrics), supporting a holistic view of research performance. Scopus is the largest abstract and citation database of peer-reviewed literature: scientific journals, books, conference proceedings and trade publications.